The Upton Tea Quarterly Winter, 2008 issue arrived in my mailbox a couple of days ago. This publication of Upton Tea Imports products is more than a catalog. The publication includes several interesting tea features including a history of the Tea Industry. This issue features "Part 10: Tea Imports Surge in Great Britain." The photo above shows one of several pieces of artwork featured in this issue. This one is "Professional Tea-Tasters Deciding on the Quality and Value of a New Cargo in a Wholesale Warehouse" from 1876. Upton Tea Imports includes excellent descriptions of the hundreds of teas they sell. There is also a guide with suggestions on how to buy, measure, store and prepare tea included in every issue. I had visited Upton Tea's website but had not ordered or read the Quarterly publication until I was given a copy and a gift of a personalized tin of tea by Cara in IA. (waving to Cara!) One of the special services provided by Upton's is personalization of tea packets and tins. See the top photo in this post. In my opinion, personalization makes a tea gift even more special! 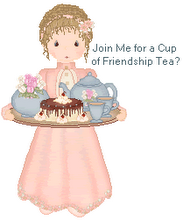 Upton Tea Imports is a mail order company for teas, teapots, tea gadgets and more! For information visit their website here. I LOVE Upton's Tea and their tea quarterly and will be stalking the mailbox looking for this new issue. It is just packed with info, isn't it? I save all the back issues, too, as it's really much, much more than just a catalog! I just never knew Tea could be so interesting. How special to have your name on the tea. I guess this tea is very expensive?